Is there any way to turn the birdie into a shamrock? Did you see you driving, too? I'll turn it into a shamrock and post for you in a few minutes. Any of these work for you? Let me know. I like the spiffed up version and the St. Patricks Day version - let's keep them both on file! I keep all the images I make on my photobucket account so they always remain in this thread. So you can come back here and find the links to them when you want. Thank you Brandi! I loved them both it was hard to choose. Thanks a bunch! 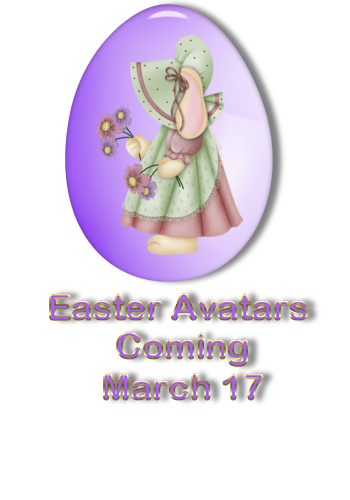 I just made you the cutest Easter and Springtime avatars this morning. I think you'll love them! 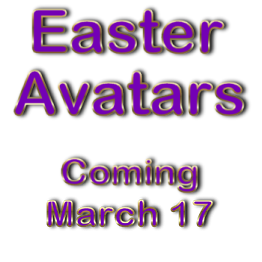 I'll post Easter on March 17th! Hi Brandi.Can you dress up kitty? I have een flat on back after breaking my back, hence delayed. I am so very sorry to hear you hurt yourself! h you a speedy recovery! I made you Valentines and St. Patrick's Day avatars. I'll post them here in case you want to save the Valentine's one for next year! `THANK YOU SO VERY MUCH BRANDI. I'm sorry I didn't get to post this sooner.. life has been wacky and I haven't been on here very much. But I really loved these. They were adorable! Thank you so much, Brandi!! I appreciate that! It's always fun to go through these pages and see all the different creations. I don't know how you do it, but WOW. I look forward to seeing what you make for St. Patty's Day (for me). Hot off the press, anothermonkey! Do you like these without a background ok? If you have any requests, let me know. They're adorable, Brandi! Thank you so much!! Be sure you come back in 11 days for your Easter designs!